The Bangkok International Airport at Don Muang is one of the busiest in Asia handling more than 80 international airlines. The airport is divided into two sections, namely International and Domestic. The International section has two terminals, Terminal One and Terminal Two. There are signs as you approach both terminals listing the airlines using each terminal. For international flights, check-in time is at least 2 hours before scheduled departure time. Once inside the terminals, you will find all the facilities you need including restaurants, drink kiosks, foreign currency exchanges, postal services, magazine, newspaper and book sellers, florists and tourist police booths. After passing through Check-In and Immigration, you enter the Departure Concourse where there are many more facilities as in the public area. Here you will find an amazing selection of duty free items at very reasonable prices. The airport authority operates a free shuttle bus service between the International and Domestic Terminals. The Domestic Terminal is equally well appointed with the exception of duty free shopping. Check in time for domestic flights is one hour before the scheduled departure. Smoking is prohibited within all the terminals except in the designated Smoking Rooms. How to get there: There are many ways to get to and from the airport. There are the special airport buses that travel four routes, one to the Silom Road, second to Sanam Luang area close to Khao San Road, third to Sukhumvit Road and the fourth to Hua Lumphong Railway Station. The State Railways of Thailand has a railway station across the road from the airport. This can be reached via the pedestrian overhead bridges. Most hotels operate a limousine service to the airport and of course you can use a taxi. Bus Routes 29, 59, 95, 510, 513. It is located on Vibhavadi Rangsit Road slightly beyond Bangkok International Airport. Covering an area of 38 rai, the National Memorial is under the responsibility of the Armed Force Education Department, Supreme Command Headquarters. There are wall paintings depicting historic events in Thai history from the Sukhothai period to Rattanakosin period, replicas of royal decorations, bas-reliefs of the establishment of the city and models recounting historic battles in Thai history. Open : Mon. - Fri. from 9 a.m. - 3 p.m.
Tel : 0 2532 1021. A speaker is available for a group visit but advance contact in writing is required. The Royal Thai Air Force museum was set up in 1952 with the purpose of collecting and restoring defense articles of different periods including equipments and aircraft in use during the early period of Thai aviation history up to the present. The RTAF museum was first located at a hangar west of Don Muang airfield and was not opened to public until 27 March 1959. The present musem was constructed in 1968 at a total cost of 6,635,000 Bahts. The museum was officially opened to the public on 24 January 1969. 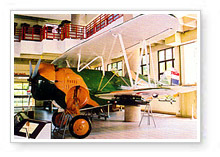 The exhibits at the Royal Thai Air Force museum feature many types of aircraft rarely found anywhere else in the world. Many of the were in the service during the war and played a vital role in the safeguarding of our nation's independence. The numerous victory Medals awarded to the RTAF pilots attest to the bravery and valour of our heroes. The Royal Thai Air Force has tried to develop its museum to ensure that it has complete historical records of the Royal Thai Air Force.